Manufacturer of Genuine Czech Glass Beads, Crystals, Pearls, Preciosa Beads and Pearls, Tools and Supplies. How Well Do You Know Your Beading Skills? Take This Quiz To Find Out! Creating your own personal jewelry is really fun and it can become an addictive hobby. There is something very special knowing that you get to wear something you designed and created from scratch. When it comes to beading,the problem with some people is that they don’t know where to start or they get confused with the many different types beads like: seed beads, czech glass beads and many many more. If you are one of those people, we recommend you take this quiz and see how well do you know your beading skills. What type of jewelry interests you most? Which of these skills is your best one? Which are your favorite tools for beading projects? Which the following terms is unknown to you? Which supplies do you work with most? Where do you work on your beading projects? I have a work space dedicated to my beading work. I have random beading supplies everywhere my house. Where did you learn how to bead? I took classes with a personal instructor. My mother, grandmother taught me. What’s the most annoying thing for you when it comes to beading? Not having enough space for the work. Not having enough time for dedicating to the beading. Do you like experimenting with new stuff? Did these questions make you start thinking about what can you do to improve your beading skills? Were your answers as you expected or you realized there is always something new that should be learned? If you have spent a lot of time on just one type of work, and one type of skill, then maybe it’s time to try and learn some new technique and see how it goes from there. Good luck! As any experienced beader knows, having proper lighting is extremely important. It is often, unfortunately, forgotten. You might think you have enough light to create your beading project, but after a few hours, your eyes can feel tired and you might develop a headache. You might spend money on having the best supplies, but you cheat yourself of the resources you need to use those supplies accurately and beautifully. That’s why you need to invest in the right magnifiers, lamps, and light bulbs to let your creativity shine. For centuries, artists have had to rely on daylight to create their paintings, jewelry, or drawings. In the modern world, we have the luxury of creating art at any time of day! Or, our busy lifestyles mean we can only create jewelry late at night. Either way, relying on lamps can cause problems. Poor light can add to eye strain, overly harsh lighting can create painful glare and accurate color-matching is difficult without daylight. Different colors and intensities of light affect the eye’s ability to stay on task. Proper neutral lighting offers greater accuracy when using color. Avoiding glare means avoiding damage to the powerful, yet delicate, retina. Using sufficient light means preventing squinting, as well as the eye strain and headache that can accompany it. Proper lighting allows you to see the true colors of the seed beads and Czech beads. Some jewelers even go outside to use daylight to see their beads in their most natural forms. The wrong lighting can make what seems like a beautiful beaded project, a disaster when true lighting is revealed. The best lamp to use with wholesale seed beads is one with a daylight setting. This provides proper light for your eyes to work their best, and for you to see the colors in their most pure state. An adjustable lamp lets you eliminate glare, and focus on the areas you need to see most. If you already have a lamp, make sure you have a very bright bulb. Even if you don’t have a daylight lamp, bright light will still help see the beads better. Try searching for a daylight light bulb you can install in your existing lamp! If you work with seed beads, you might want to consider also purchasing a magnifier. There are many types, and you’ll have to try a few to determine what works best for your beading style. They can make it much easier to focus on the tiny seed beads. You can order these online, or at your favorite craft store. Your eyes, and your jewelry, will thank you. Have you ever accidentally put plastic beads in a microwave? It can be a very messy accident. Most plastic beads, like pony beads, do not like high heat. If one of these beads ends up in the microwave for too long, not only will you have ruined beads, but also a ruined microwave. 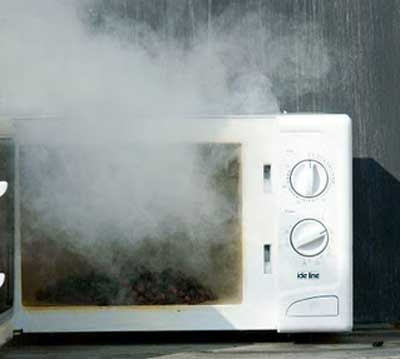 Plastic easily melts in high heat, especially the microwave. After just a few minutes, your plastic beads will turn to a flat puddle of plastic. The heat melts the beads, and then they all fuse together. Before you get sad, there are actually many crafts you can make by melting beads! You can create your own sun catcher or hanging mobile with just an oven, some plastic beads, and a pie tin or muffin tin. Here’s how you can do it. First, gather your beads and pans. You can also use some string and wire. The easiest way to start is to fill the bottom of each muffin tin with a variety of plastic pony beads. 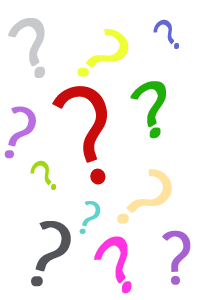 They can be in a design, like a star, a pattern, or just a random mix of colors. Either way, it will turn out beautiful. If you want to go a little bigger, you can also cover the bottom of a cake or pie tin. This can also be done with a set design, or just freestyle colors. 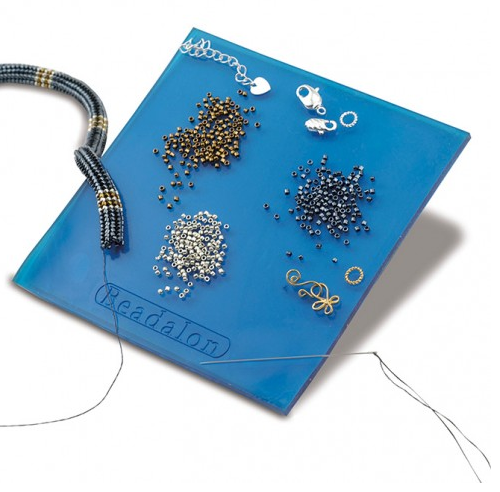 Try stringing the beads on thread or wire and laying it in the pie tin for some artistic experimentation. You could spend a whole afternoon trying out different designs and patterns for your beads. Once you’ve settled on a design, turn on your gas grill or your oven to high, or 400 degrees. Put the pan with the beads in the grill or oven, for 5 minutes in the grill or 20 minutes in the oven. During this time, the plastic beads will begin to melt and fuse together. Once the time is up, take the pans out and wait for it to cool. You will see how the beads have melted into a flat pancake. Once your beaded creation has cooled, pop it out of the tin and it’s ready! Look at the beautiful design you have created, and try holding it up to the light to see the sun come through the colorful beads. You can do all kinds of things with these creations. Drill a hole in them, thread some ribbon through them, and hang on a porch for a beautiful suncatcher you can enjoy all year long. With the smaller muffin tin beads, you can drill a small hole in each, and hang them as a mobile for a child or baby. While beads will melt in the microwave, you can actually create a thing of beauty with them! Try experimenting with this fun and easy craft. If you are new to beading, all the different tools and materials may seem confusing. With so many different projects that can be made with beads, it’s difficult to determine which tools you need. Many beaders struggle with making great jewelry when they are trying to figure out what beading tools to use. Discovering the right tools and realizing when to use them will make your beading so much easier. Here is a quick guide to basic beading tools and when you will need to use them. The chain nose pliers will be your main ‘go to’ beading tool, the first you reach for and last to put down. This will be your most used basic jewelers tool in your starter beading kit. It will be like a second set of hands as you progress through learning the beading techniques and will become the foundation of all your tools. You only need one pair to start, but as you build your beading toolkit, you will want to invest in a few pairs of different sizes. Don’t confuse chain nose pliers with other beading pliers. If you look closely, you will see that the chain nose pliers have a tapered nose that narrows to a fine tip. These are also similar to household pliers, but you must buy ones that are specific for jewelry. Don’t go to the hardware store to buy chain nose pliers! The round nose pliers have a strong resemblance to the chain nose pliers but they are quite different. The round nose pliers nose is completely round intended make loops, circles, curves and soft edges when using sculpting wire. They are perfect for making earrings, charms, pendants, or other pieces that require small loops. The wire cutters are used to cut the stringing materials for your beading projects. Make sure you use a strong enough pair of wire cutters for each type of wire. The thicker the gauge of wire, the stronger the wire cutter needed. After purchasing these three basic beading tools, your beading will improve drastically. Having the right beading tools will allow you to create beautiful projects in just a few hours! All your friends will want to know how you created such a masterpiece – one that looks like it came from a store! 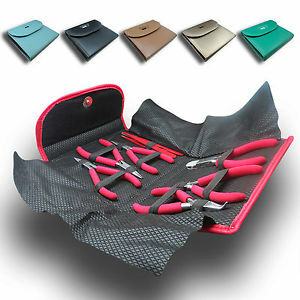 Buy these bead tools wholesale for a great deal on high quality tools. Don’t buy cheap tools that break easily, make an investment and you’ll be beading your whole life. Being able to craft your own custom jewelry or decorate items in your home is a great skill. Beading is one of the most popular methods to make unique designs and in a way, personalize your everyday life. Before starting to craft with glass beads, people often have tons of questions in their minds. So, in order to address some of those concerns, we have created a list of the most common doubts beaders have. If you found yourself wondering about anything related to beading in recent times, keep reading this article. How do I select the size of a clasp? The size of the clasp should always be in proportion to the size and weight of the pieces used to create the item (necklace or bracelet). For instance, a massive necklace will look ridiculous with a small clasp. Moreover, the clasp might even not be strong enough to hold the beads and will eventually fall apart. Also, if you put a heavy clasp on a small piece, it will have a tendency to fall to the front of the necklace. You don’t want to wear a necklace that will need to be ‘fixed’ constantly, do you? I can’t get the wire through some of the stones I just bought. Stone beads can sometimes have a hole that is slightly off its center. Try to enlarge the hole with a bead reamer, if possible. If the wire can go through it now, great. If not, try using a thinner wire. Do I need a bead board to be successful in beading? A bead board is one of the wide range of tools you can use for crafting beautiful items out of beads. These tools can come in different shapes and sizes (but usually plastic) and may help you in making your designs and measure the length of your pieces. How to buy wholesale beads online? Whether you are after a bulk of Czech crystal beads or any other type of gems, you have to know couple of rules for shopping wholesale stones. We hope this list managed to give answers to some of your questions regarding your beading adventures. Remember – take your time in learning few skills, choose carefully when buying and let your creative skills come to the surface. If you have been reading our posts regularly, you must know what rhinestone connectors are. But, for those who are not familiar with this term, here’s a simple explanation: rhinestone connectors are strands made of hotfix stones, used for decorating and adding sparkles to accessories and clothes. The most common use of these connectors is on bikinis, mostly on those worn at competitions, pageants and all kinds of swimsuit contests. Besides competition suits, connectors are also used for some DIY projects with hot fix rhinestones, such as making a custom headband or crafting beautiful bracelets. If you enjoy DIY projects with rhinestone connectors, then you might want to know how to detect quality pieces easily and what to avoid while shopping. Imagine yourself standing in a shop, sparkles all around, pure magic deriving from different shapes, colors and glitter – don’t get carried away by the feeling of excitement! Instead, focus on choosing the best pieces to use in your project. Here are couple of tips to follow while in pursuit of quality stone connectors. The first thing you have to notice is the setting and how are the crystals placed. If they’re glued, you are probably looking at a low quality product. Check out how the stones are held in place and how secure are they – pay attention to details to make sure the stones are well placed and won’t fall off easily. You don’t want to go home and end up with connectors that will miss stones! Second, take a look at the reverse side and pay attention to how well the item is soldered. It should have a smooth surface, without welds that you can feel when touching the product. If you find any noticeable welds, there’s a huge possibility the connectors would rip some trimmings on your clothing etc. Third, check how easy the links on the connector move together. If you notice some kinks or stiffness in their movement, you might find it difficult to place it the right way or experience some inconvenience while wearing the item with the connector. Extra tip: If you are not shopping in a physical store, but ordering wholesale connectors, the above mentioned tips won’t apply. In that case, try to read reviews and visit forums where customers discuss the quality of the product. Also, if you avoid buying Chinese connectors, you might eliminate a great chance of getting stuck with a lemon. Choose wisely, so you won’t have to spend your money on low-quality items! Some jewelry enthusiasts’ start beading the easy way, they just go to the store, buy whatever looks good for them, go home and start with it. But, others have so many questions before even buying the beads, and many more after they start beading and stuck in the middle of it. The Internet is a proof that these questions exist and people would like to know the answers and be well prepared. First thing everyone has doubts about is the shape of the beads and what type of beads should they be working with – whether plastic beads or glass beads. There are no rules for this whatsoever, it is just a matter of personal preference. If you are going for the ‘glamorous look’, we suggest that you use glass beads, as they have shiny brilliance and will give your finished product an expensive touch. Plastic beads can also do the job, but are more suitable for the ‘casual look’. As for the shape, anything you can imagine as a shape can be found as beads shape. Some of the most popular are: square beads, rocaille beads, long beads, flowers, ovals, buttons, celestials, squares, faces, drops etc. However, shape is not that big of an issue for most beading lovers. But, the fit of the beads on the yarn or the material you are using for threading the beads can be a bit delicate. It’s a tricky thing to choose the right bead size and have the beads stay put but also to move lightly along the material or the yarn so that a bead does not travel quickly and move to an unwanted position. It is not that big of a deal if you try hard to learn it – after beading several items, it will eventually become an easy task for you. How to Choose the Right Clasp? When all is done, clasps are another thing that confuses people how to choose the right size. Remember, the clasp is supposed to be proportionate to the weight and the size of the beads used for that project. Take as an example, one big, chunky necklace – this necklace will definitely need a bigger clasp, since small ones won’t hold the weight. It goes the opposite way as well, you can’t have a big clasp for a piece of jewelry that is small and light. Should I use a Beading Board? The bead board is yet another thing some get confused about and wonder do they really need it or not. This is a tool that you need in your collection of beading tools for getting great results. The bead board is actually a plastic tray which comes in various colors and sizes and you use it as a tool for creating your design, taking measures, lengths before any of the real work is done so that you can have all the exact measurements and designs. So, yes, using a beading board is a pretty smart move. When working on a necklace and beading the beads on a cord, many have said that they can’t find the right bead that have a large hole that will fit right with their string. There are not beads that can fit right with a cord that is 1mm or even larger than that, but there are plenty of options that can be used. That’s where the glass beads come in, they can accommodate with different types and sizes of cords. We hope this helps! Happy beading, everyone! If you are new to using glass beads, there are some things you should know before you begin! Glass beads are a great choice for jewelry making, crafting, and embellishing just about anything. Glass beads come in a wide range of colors & shapes, perfect for any project. Purchase glass beads in large quantities to save money and to guarantee you always have a large stock of glass beads. Buying wholesale glass beads is a great way to do this. Pay close attention to the colors and sizes of the beads you are buying, especially if you want them to match beads you already have in your collection. Buy seasonal pieces at the end of the season when they are placed on clearance and save them until the following year when they come back into season. Pay attention to sales and deals, you don’t want to miss the best price! Invest in a bead organizer so your glass beads are easy to find when you need them. Separate your beads according to size, center hole size, color, and materials. This will make it easy to determine which beads to use. Organize your tools as well so you can begin beading quickly. Invest in a good source of light like a desk lamp at your crafting work space. If you pour the beads out onto a slick surface they can slide off. Try placing thin cotton material over the table so that your beads will stay in place. If you use a white cotton material your beads will be easier to see than if they were spread out on a colored cloth. Design the beads on the table in the order you want them before you string them to the wire. This way you can see how your design looks and change it if necessary. -Before you use your glass beads, it is important to clean them to remove any dust or debris that has gathered in the hole. You can also clean your beads after years of wear, if they have gotten dirty or just need some sprucing up. There are many ways to clean glass beads. You can use vinegar, warm water, or water and lemon juice. A great way to clean glass beads is with denture cleaning tablet. Place the beads in a large bowl or cup, fill with water, and then drop in the cleaning tablet (or as directed). When you are finished soaking them, use a slotted spoon and lay the beads out on a clean dry towel to air dry. Glass beads are fun material to work with and can create the most beautiful finished projects. Experiment with glass beads today by buying wholesale beads from Mode Beads. Rhinestones may seem like an innocent crafting material, but when put in the wrong hands, they can be dangerous. You may not think this is possible, but it is. If you follow a few precautions, however, you will be able to use rhinestones without worry on your beading and jewelry projects. All quality rhinestones are made of glass coated with lead. The amount of lead in rhinestones ranges from 23-30% lead by weight. Lead is a very poisonous material, and can cause birth defects or reproductive harm. Most rhinestones comply with state or federal lead standards, but you must be careful. Crystal rhinestones from some suppliers may contain lead. If you are unsure if the lead quantity in your rhinestones, it’s important to follow the following rules. Do not place rhinestones in your mouth, or place your fingers in your mouth after touching crystal rhinestones. Use applicator sticks to apply them, and wash your hands after applying crystal rhinestones. If you have children around you when you are working with rhinestones, be extra careful that they do not place rhinestones in their mouths. Children are most at risk of lead poisoning from rhinestones. If you have children around you when you are working. Be sure they wash their hands if they touch the rhinestones. State and Federal Laws have become strict on the use of Lead-containing “anything” on children’s clothing (age 12 and younger). Learn these laws and observe them. To avoid having issues with lead poisoning, do not put crystal rhinestones on plates, silverware, drinking glasses, or other containers that hold food or beverages. This will expose people to lead poisoning. It is also important to make sure rhinestones do not have any damage or cracks that could result in a part falling off. Another issue with rhinestones is a potential choking hazard. Rhinestones are typically small and sometimes sharp, both of which make them a danger to small children. Keep rhinestones out of reach of children, which also means not putting rhinestones on toys, garments, or other items meant for children. The US government recently had to recall pacifiers that were decorated with rhinestones, as they caused a choking hazard to the children who used them. Use common sense and avoid increasing the change that children will come in contact with a small choking hazard like rhinestones. These pieces of advice may worry you, but they will only make you safer around crystal rhinestones. If you follow these simple tips, you will be able to use rhinestones worry-free, and continue to create beautiful jewelry and crafts using wholesale rhinestones. © Copyright 1990 - Modebeads.com All rights reserved.